Beatles animator visits Naples for three-day art show. Beatles Radio: The Beatles, Solos, Covers, Birthdays, News The Fab 4 and More! 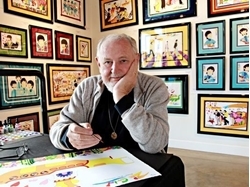 Beatles animator Ron Campbell directed the British band's 1960s cartoon and also helped animate its 1968 film, "Yellow Submarine." Chances are most anyone reading this was touched in some way by a man whose name few will even recognize. Ron Campbell never met The Beatles but he directed the Fab Four's 1960s cartoon series. And he's had a hand in cartoons including "The Flintstones,""The Jetsons,""Scooby-Doo," "Rugrats" and "Smurfs." He also was one of the animators for The Beatles' feature film "Yellow Submarine." “The best part of my career is never saying, ‘Oh sh*t I have to go to work,’ “ Campbell, 78, said in a recent telephone interview from his Arizona home. Campbell will be in Naples to meet customers and sell his art work Friday through Sunday at an art gallery along Third Street South. The Australian native said he began his career in the late 1958s, animating television ads. American film and TV producer Al Brodax noticed his work and hired him to work on Krazy Kat and Beetle Bailey cartoons, Campbell said. Brodax helped to create The Beatles cartoon — which ran from 1965 to 1969 on ABC in the U.S. — and he recruited Campbell for that project.